You can return to our feature ideas page or browse the pictures using the next and previous links. 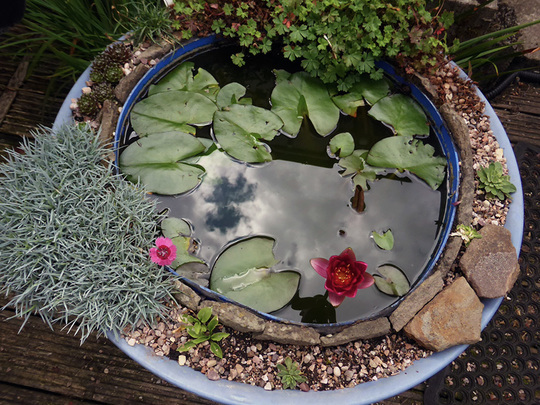 Wonder how many of you remember me making this useing a part plastic barrel with a planter set inside,must be five years ago at least the water lily was planted at the time and flowered within months,but until now no more flowers only leaves obviously needed heat as in the last week we have colour.the whole thing has worked remarkably well more than half the planting original ,one mod the stones for the birds to stand on many drink and wash there heads in the warm weather. Yes I do remember you constructing this Brian ... long time for another flower to bloom ... but well worth the wait! I remember too it looks great how deep is the barrel Brian. ? Thats answered my last question, I bet the birds have been queuing to have a wash & brush-up . Thank you Brian I was asking as I ve bought some round tubs and wondered if they woukd be deep enough to take a big water lily as I have small and big water lilys. But I do love this with the planting on the out side. That looks really pretty. Well done. Cute design, Brian... added to GoYpedia. Yes, those water-boatmen grow quickly don't they. Oh! It looks lovely, I have done something like this but yours looks better than mine, I see a revamp coming on when I I'm fitter due to a few set backs health wise, roll on next year LOL. Mine is set in the ground but I'm sure I can come up with something to improve mine? I have a half barrel too, thats ok but need to make some steps up to it so the frogs & so on can get in & out safely, may just put a plank of wood by it with little bars across it, think it may work LOL. Mine has got duck weed in it, it just appeared Grrr! keep scooping it out, I saw a little Robin on the Waterlily leaf having a bath the other day, I wish I had had my camera with me :o(( would have made a lovely picture :o)).